Destinations=>ExtensonsUnder the Advanced Settings section, the basic settings for the mailbox can be configured. Destinations=>VoicemailThis area allows for total configuration of the voicemail box, including features like Broadcast and Cascading Message Notification. Smart Personal ConsoleGives end users the ability to configure some mailbox settings. Mailbox This is the mailbox number, which must be a unique 3 or 4 digit number. Name This is the name of the voicemail box. Password This is the password to access the voicemail messages. Only numbers are allowed. User E-mail This is the email address associated with this mailbox. Attach to Email Defines whether the PBX will send an email to the user informing them they have a new message. An audio file (.Wav) of the message will be attached. YES = send email with attachment. NO = do not send an email. N/A = use the system wide default defined under PBX SetupVoicemail. Delete After Emailing Defines if the voicemail message will be deleted from the PBX after the email has been sent. YES = delete message after it has been emailed. NO = do NOT delete message after emailing. Note: This feature should not be enable at the same time as Turn Old After Emailing. Turn Old After Emailing Defines if the voicemail message will be sent from the NEW folder to the OLD folder after emailing. YES = move message to Old messages folder after emailing. NO = leave the message in the NEW messages folder after emailing. Note: This feature should not be enable at the same time as Delete After Emailing. Say Caller ID Defines if the Caller ID will be played prior to playback of the message. YES = state caller id prior to message content playback. NO = do NOT state caller id prior to message content playback. Allow Review Defines if the caller is permitted to review and take action on the message they leave. YES = allow callers to review and re-record the message they left. NO = do not allow callers to re-record their message. Allow Operator Defines if the caller is permitted to press “0” to reach the mailbox operator while leaving a voicemail message. YES = allow dial 0 while listening to mailbox greeting. Play Envelope Message Defines if the system will play caller ID and time of call prior to playback of the message. NO = do not play message details prior to playback of contents. Auto Delete VoicemaiI In Define the number of days in which voicemail messages are to be automatically deleted from a mailbox. If this is set to “0” (zero) the voicemail message will never expire. Allow Dial Out Access This permits the user to dial out from voicemail. Exclude from Directory This indicates whether to exclude the extension paired with this mailbox from the directory. Mailbox Operator Defines where to route a calller if they press “0” (zero) while listening to your mailbox greeting. Set this to None to use System Default from value defined at PBXSetupGeneral. Mailbox Exit Destination If a caller remains on the line or presses # after leaving a message in this voice mailbox, this is where they will be routed. Set this to None to use System Default from PBXSetupGeneral. Broadcast Messages If this setting is configured, messages that are directly left in this box are broadcasted to the boxes that are added to the list. Note that messages forwarded to this box are not broadcast. Cascading Message Notification If enabled, the Cascading Message Notification feature will be activated, allowing you to configure the system to call a single or group of phone numbers when a new voicemail message has been received. The following outlines the steps to create a stand alone voicemail box. From the Destination=>Voicemail page, click the Add Mailbox button located at the top left corner of the page. The Edit Voicemail Box Settings page is displayed. Using the table of parameters and descriptions above, configure the voicemail box to meet your business requirements. Click button to save the changes. The system returns you to the Edit Voicemail Box page. Click the Apply Changes link located at the top right hand corner of the page, to commit the changes to the database. 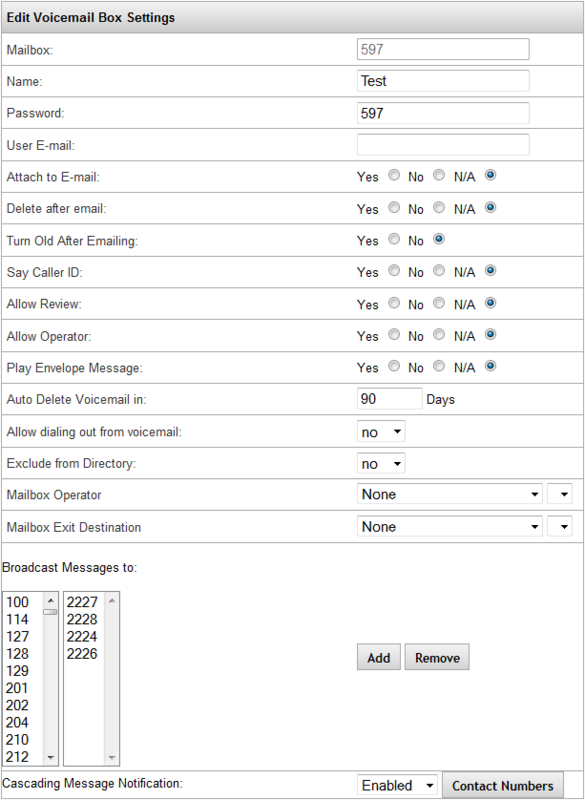 The following outlines the steps to modify voicemail parameters. 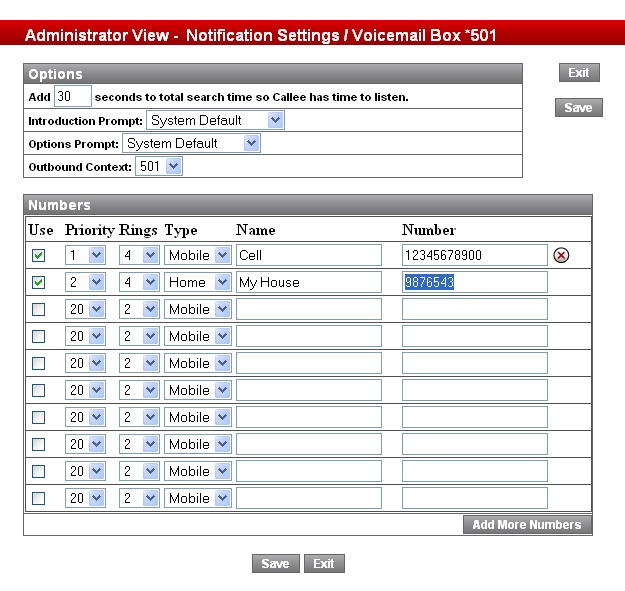 From the Voicemail Box Setup page, locate the mailbox that you want to update. Click the icon to the right of the Mailbox Name. The Edit Voicemail Box Settings page is displayed. Make the necessary changes to the extension information. The following outlines the steps to clear a voicemail box of all messages and greetings. From the Voicemail Box Setup page, locate the mailbox that you want to clear messages from. Click the icon to the right of the Mailbox Name. The messages from that mailbox will be deleted. Click the Apply Changes link located on the right hand corner of the page, to commit the changes to the database. From the Voicemail Box Setup page, locate the mailbox that you want delete. Click on icon to the right of the Mailbox Name of the menu you want to delete. The mailbox is removed from the Mailbox listing. From the Edit Voicemail Box Settings page is displayed. Scroll to the Broadcast Messages section. Select the mailbox from the left list box then click the Add button. The item selected will populate the list on the right. CTRL and Shift clicking is supported to select multiple mailboxes at once. Select the mailbox from the right list box then click the Remove button. The item selected will be removed from the list. <p>CTRL and Shift clicking is supported to select multiple mailboxes at once. Cascading Message Notification works along the same principle as FollowMe, but pertains to voicemail messages. When configured, if an extension gets a new VM, the PBX can call a variety of numbers, in the order defined, to inform the user of the message. Note: Once the call is answered, the user will have the ability to listen to their message from their phone, or to refuse the call. Until the voicemail box has its new messages cleared, the system will continue to call out when the Notification Interval is met. Navigate to the Edit Voicemail Box Settings page. Scroll to the Cascading Message Notification section. Select Disable to turn the notification feature OFF. Select Enabled to turn the notification feature ON. Locate the Cascading Voicemail Notification Interval, set the value to the desired number of minutes, the PBX will check for new emails and make calls to notify when the interval passes. Default is 5 minutes. Cick the Apply Changes link located at the top right hand corner of the page, to commit the changes to the database. This allows you to configure how many seconds the system will spend searching for the called party. Default is 12 seconds. Introduction Prompt plays “You have new messages” after you answer the call. This can be set to any custom prompt you have recorded on the system. Options Prompt plays “Please enter your voicemail password, or 2 to reject this call” after you answer the call. This can be set to any custom prompt you have recorded on the system. Outbound Context gets set to an extension number, and will use that extension’s Class of Service when making outbound calls. Configure the numbers you wish to be called when a VM message is received. The calls will be made in order, with 1 being the highest priority and 20 the lowest. You must check the Use column for each number to be considered active. If you wish to delete a number, click the button then save and exit. From the Destinations->Voicemail page, click the pencil of the mailbox you wish to edit. The Notification Settings / Voicemail Box window will appear. Set the parameters based on the description of the values provided in the table above.